Sitia Airport (IATA: JSH, ICAO: LGST) is a small community airport in the region Mponta of Sitia Municipality, on the eastern part of Crete in Greece. The facility is serving the city of Sitia. The airport is located 1 km north/northwest of the city center. Sitia Airport began operations on June 7, 1984, when the first aircraft landed on the facility. This was an Olympic Airways' Dornier Do-228, registration SX-BHF. This was a test flight, to test the airport and its handling facilities. The airport was officially opened 2 days later, on June 9, 1984. 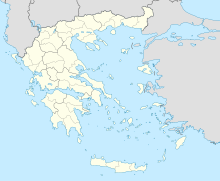 Its official name became Δημοτικός Αερολιμένας Σητείας, literally Municipal Airport of Sitia. At 10:30 the same day, the first official flight, OAL 7001, arrived. On June 13, the first flight from Rhodes arrived, followed by a flight from neighbouring island Karpathos the next day. On May 20, 1993, the airport's services moved to a newly built terminal building and control tower. The new installations cover an area of 550 m2. A new runway, oriented 05/23 and with a length of 2074 meters was completed in May 2003. Also, 3 new taxiways and 2 new aircraft stands have been constructed. Additionally, the old terminal building has been replaced by a temporary building, covering an area of 1,000 m2. On January 13, 2016, the airport's services moved to a new terminal building. The new building has an area of 7,500 m2. Condor is set to become the first international scheduled operator to serve the airport with weekly flights from three German cities to launch in May 2018. By car the airport can be reached via the main road along the North coast. From Aghios Nikolaos, heading west, the main road transforms into the National Road of Crete. The City of Sitia is just a few minutes drive away from the airport. Besides rental cars, there are taxis available to any destination on Crete. There are no bus connections available from the airport. ^ a b c d "SITIA AIRPORT". ypa.gr. Retrieved 8 June 2016. ^ "Μετονομασία Αεροδρομίου Σητείας σε Δημοτικό Αερολιμένα «Βιτσέντζος Κορνάρος»". Retrieved 18 February 2015. ^ a b "Flight". apollorejser.dk. Retrieved 9 October 2018. ^ a b "Flight". apollo.no. Retrieved 9 October 2018. Airport information for LGST at World Aero Data. Data current as of October 2006.